Is Obi-Wan Kenobi the toughest Bounty Hunter in the Star Wars Universe? This week, the Regular Show comes to Saturday Morning Cartoons and John Belushi returns from the dead! Clone Wars heats up with a trial to test Obi-Wan's undercover bounty hunter skills as well - minor spoilers ahead! In this episode, Anakin Skywalker eerily faces a similar dilemma to the one Luke battled in the Empire Strikes Back - does he rescue Obi-Wan, or be patient and wait? Yoda pleads with Anakin to stay, but with no success. Obi-Wan, still disguised as Rako Hardeen, enters a deadly bounty hunter tournament held by Count Dooku. Several interesting bounty hunters make their debut in this clip, as Rako and Cad Bane make their way through a level of the Super Mario Bros. style deathtrap called The Box. Regular Show – "Think Positive"
Regular Show is here due to popular demand! Honestly, I never watched the show before this week, and it's a nice throwback to the silly fun of Ren & Stimpy. In the first clip, Benson is called into Pops' office and told to stop yelling at Mordecai and Rigby, or else he's going to get the axe. This episode shows us all what happens when we keep the anger in, pressing it down a layer at time. Rigby and Mordecai love this, running amok without Benson's yelling, until Benson lets his rage out and destroys an entire park. The park is eventually spared, but Rigby and Mordecai walk away with permanently damaged hearing. Marvel Anime: Blade – "Dead on Arrival"
This episode features a nice flashback scene showing a younger Blade defending a young girl from the vampire Baron Howard. During the battle, Blade meets Noah Van Helsing, a vampire hunter, and Noah cures Blade of his vampire cravings and teaches our favorite slayer how to hone his craft. Mary Shelley's Frankenhole – "Robert Louis Stevenson's Belushi"
John Belushi is back!!! David Cross stars in this episode as the voice of John Belushi, who is is terrifying the town by being his loveable old self. Dr. Hyde visits Frankenstein and offers him a serum turning an individual into the worst version of himself. John Belushi drinks the serum, and becomes the worst thing imaginable...Jim Belushi. My Little Pony: Friendship is Magic – "The Super Speedy Cider Squeezy 6000"
It's cider time! The Apple family is making their world renowned cider, but two out of towners, the Flim Flam Brothers, show up with a new invention to speed up the process. The Brothers want in on the Apple Family's business, but they aren't getting a taste. The Regular Show airs Monday nights on the Cartoon Network. Blade airs Friday nights on G4TV. 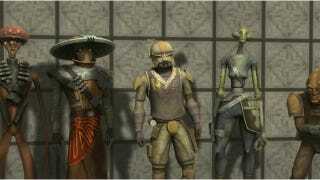 Star Wars: The Clone Wars airs Friday nights on the Cartoon Network. Mary Shelley's Frankenhole airs Sunday nights during Adult Swim. My Little Pony: Friendship is Magic airs Saturday Mornings on The Hub, when cartoons should air.